The world's most endangered orangutans could be pushed towards extinction after an Indonesian court approved a controversial dam project, say campaigners. The 22 trillion rupiah (£1.15bn; $1.5bn) dam will be built in North Sumatra's Batang Toru forest. The region is home to the Tapanuli orangutans, which were only identified as a new species in 2017. Only 800 of them remain in the wild and they all live in this ecosystem. One scientist, who acted as an expert witness in the case, told the BBC the move would "put the orangutans on a firm path to extinction". The billion-dollar hydropower dam, scheduled for completion in 2022, will be constructed in the heart of the Batang Toru rainforest, which is also home to agile gibbons and Sumatran tigers. It is expected to supply electricity to the North Sumatra province and will be operated by Indonesian firm PT North Sumatra Hydro Energy. The company said the 510-megawatt dam would provide clean electricity to the region. According to the Jakarta Post newspaper, the dam will be constructed by Chinese state-owned firm Sinohydro. The Bank of China is one of several international banks funding the project. Environmental group the Indonesian Forum for the Environment (Walhi) had earlier this year filed a lawsuit against the North Sumatra administration, challenging its decision to green-light the project. But the Medan State Administrative Court in North Sumatra has now rejected the lawsuit, clearing the way for the dam to be built. "The judges reject every part of the plaintiff's lawsuit," presiding judge Jimmy C Pardede said, according to the Jakarta Post. The judges said a proposal which detailed the environment impact of the project was in line with existing regulations. Walhi has said it will appeal against the decision. Prof Serge Wich, a specialist in primate conservation at Liverpool John Moores University, said the decision was "disappointing". He had been called in by the court to assess the impact the project would have on the orangutans. He said the environmental assessment behind the project was "certainly flawed" and he was "amazed" the project had been allowed to go ahead. Prof Wich, who was one of the scientists who confirmed the existence of the Tapanuli species in 2017, said the dam would separate the already tiny orangutan population, which are clustered in three areas of the Batang Toru forest. "Where they are building the dam is actually where the density of this species is the highest, so it's actually the worst area in the forest you could build it," he said. Who are the Tapanuli orangutans? One of the three areas where the Tapanuli orangutans live will not be affected by the development, but Prof Wich said it was "very risky to have all our eggs in one basket". "[There will be] low numbers so that's not sufficient for a viable population. There are many other potential places in Indonesia to build the dam... it's unclear why this has to built here. "The dam will put the orangutans on a firm path to extinction." 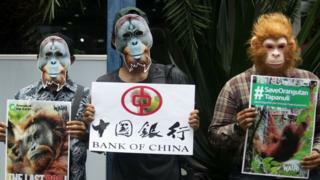 "As Batang Toru's main financier, Bank of China could pull out and stop the dam from being built," said executive director Dana Tarigan. "Primary forest is currently being cleared for the dam and scientists have documented orangutans fleeing the area. Time is running out fast." Bank of China has previously said it does not comment on specific projects. But it says it takes "all relevant factors into consideration when formulating policies and making decisions". Scientists say the tiny population of orangutans are the world's most threatened ape species. "With less than 800 left, the Tapanuli orangutan is already the most endangered great ape species in the world," Matthew Nowak, Director of Research at the Sumatran Orangutan Conservation Programme said in 2017.